After two months of good starts, Cy Sneed was able to put together a great one. The Brewers righty recorded a career-high 10 strikeouts while allowing four hits and three walks over seven scoreless innings Friday as Class A Advanced Brevard County fell to Daytona, 3-0, at Jackie Robinson Ballpark. "I felt pretty good," Sneed said. "Obviously, coming into what's probably going to be my last outing of the year, I wanted to try and finish up strong and go into it feeling as best as I can. "I really tried to prepare the last week, trying to make sure my body was feeling good for my last start, and showed up at the yard today feeling pretty good." The good feelings translated to the mound as Sneed retired his first four batters before issuing a walk to Taylor Sparks and giving up a single to Jeff Gelalich in the second. However, the 22-year-old ended the threat by fanning Ronald Bueno and Joe Hudson in succession. "Anytime you get out of a jam like that, it gives you a little bit of adrenaline," Sneed said. "You go out for the next half-inning and you want to come out trying to attack hitters and get their guys back out on the field as soon as possible." Fired up, the 2014 third-round pick stretched his strikeout streak to five by fanning the side in the third. 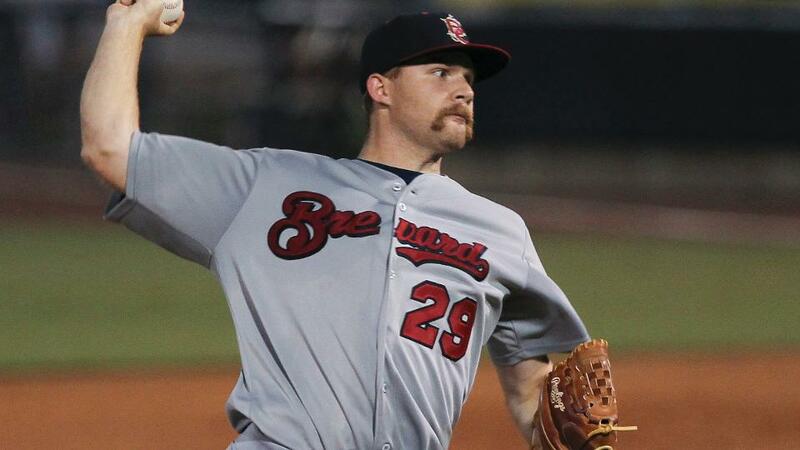 The momentum carried him through the last four frames, capping his first scoreless outing of more than four innings since coming to the Florida State League at the beginning of July. Sneed, who worked the Tortugas with a splitter and fastball, said the outing was a fitting conclusion to his first full season in pro ball. "That's what we've been trying to do [all season]," he said. "We've had some success at times and wasn't able to really put it together for a complete start, so today was kind of the first time we did that. "I've been working a lot with the pitching coach [David Chavarria] and the catchers and stuff, just trying to understand how to use my stuff against hitters. It all worked out [in terms of] executing pitches and trying to do what I can to get guys out." The Dallas Baptist University product closed his first half-season in the FSL with a 2.47 ERA and 55 strikeouts against 11 walks over 62 innings. "I feel like I did what I had to do to battle the heat and the rain and all the other factors that kind of come with this league," Sneed said. "I just tried to learn from guys who have been here and try to soak up all the information I can so that I could hopefully succeed while I was here. And I was able to do that for the most part." Sneed was relieved in the eighth by Preston Gainey (2-4), who surrendered an RBI double to Daniel Pigott and a two-run triple to Gelalich. Daytona started Reds No. 20 prospect and FSL All-Star Jackson Stephens, who scattered four hits over five frames while striking out three. The win went to Alejandro Chacin (2-0), who fanned three and gave up a hit over two scoreless innings.